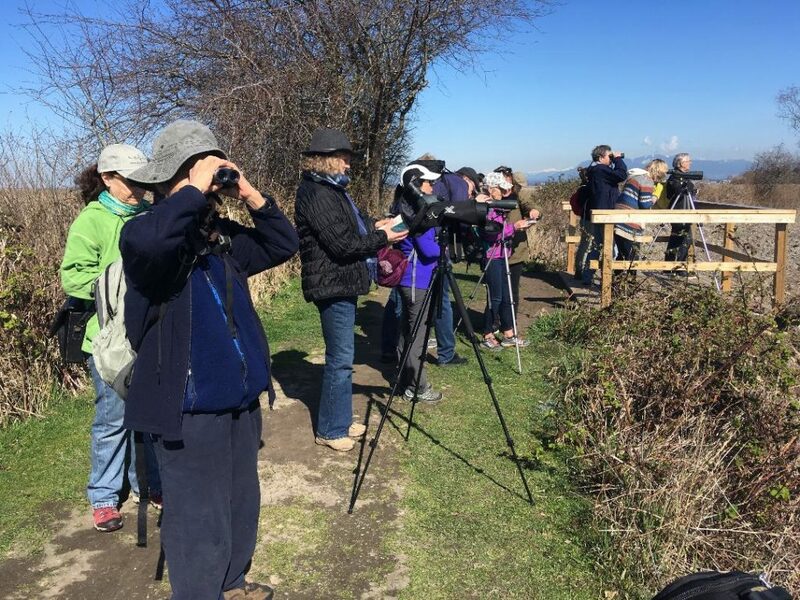 On March 30th, 2019, about thirty persons participated in this bird walk. The day was sunny and getting warmer. Some of the participants had seen this walk posted on Nature Vancouver Meetup Group, so it was great to see quite a few new faces. We started with a look at the ducks by the entrance pond after John’s brief chat about the sanctuary and its founder. The group headed off and at the feeders we found the young male Yellow-headed Blackbird which had been at the sanctuary for the last couple weeks. This was a lifer for a number of participants. The Black-crowned Night Herons had already left to their breeding grounds to the disappointment of many. We then headed down the east dyke where Ruby-crowned Kinglets, Wood Ducks, Fox and Song Sparrows and first of the year Rufous Hummingbirds drew our attention. Further along the dyke, we found a snoozing Northern Saw-whet Owl near the path in a Douglas fir. At the observation tower we closely observed Northern Pintails and Northern Shovelers. Along the outer dyke, Marsh Wrens, Tree Swallows, a Northern Harrier, and several Greater Yellowlegs sang, swooped, hunted and fed respectively. The walk finished with John calling out to a Sandhill Crane, encouraging it to walk across the pond toward us, which it did. It was a great morning out and many thanks to John Chandler for leading and imparting his knowledge to us and, to Harvey Dueck for his able assistance.